The 60m produced such an impressive selection of amazing races and UK leading times, that it’s difficult to highlight any one. However, Amy Hunt (Club: Grantham) stands out from a swift crowd, having equalled the championship best of 7.50 in the U17G semi-final before flying to the third fastest time ever with 7.43. And perhaps more significantly it’s second to a certain Katharine Merry when it comes to 14-year-olds. 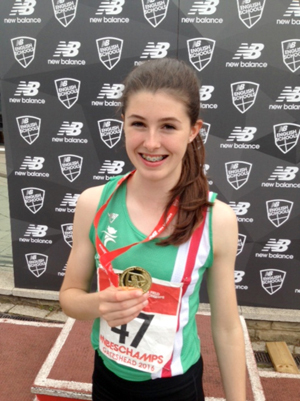 14 year-old Amy Hunt (Joe McDonnell) ran an impressive 7.43 to win the U17 girls 60m final, and moved herself up to second behind Olympic bronze medallist Kath Merry in the all-time U15 British list, a significant achievement.